Hi, my name is John Springstead. My wife, Laurie and I have owned and operated Home Inspections of USA since 1995. In 2006, our eldest son, Brandon, joined forces with us to help create "TEAM SHERLOCK!" 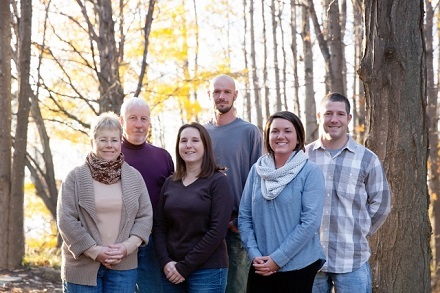 In 2008, his wife, Jen, joined our team to perform scheduling and help with marketing. In June of 2013 our son-in-law Mac Eckhardt joined our team to specialize in POS (Point of Sale Inspections) along with becoming an inspector. Our daughter Heather also joined our team to help Laurie with invoicing/bookkeeping. We feel very privileged to be able to see our family business grow to where it has. Whether myself, Brandon or Mac perform your inspection, we guarantee you will be satisfied with our detailed description and recommendations for your potential home. Our goal is to serve you, our clients, more efficiently with even better service! From 1986 to January of 2005, we also owned and operated our own construction company. This background gives us the knowledge and expertise to not only inspect your home, but to also give you solutions and ideas to remedy issues that may have became apparent during the course of your inspection. These ideas will make your new home more comfortable and valuable. Feel free to contact us at 1-800-730-6610 or 231-544-8016. Email us at [email protected] to discuss how we may help educate you in the purchase of your new home! Check out our Sample Report Link below. Thinking about having an inspection prior to making an offer? We suggest you don't and we have two reasons for that. One, most people have an idea of what they think a house is worth and what they're willing to pay. We suggest you go ahead and make this offer, contingent on a home inspection. This gives you a better chance of making sure all utilities are on and working to assure a full inspection is possible. Many sellers (banks included) are not always willing to do this without an accepted offer. Second, the seller may not have been willing to accept your original offer anyway, thus saving you the cost of an inspection! SATURDAY INSPECTIONS. Although we understand some can only attend an inspection on weekends, we find by the end of the week, we also are in need of some "time off". What we suggest is having the inspection performed during the normal work week, receiving the completed report for review, and then decide if it is necessary to have a "walk through" in person with the inspector to explain unanswered questions. We find the majority of clients find a walk through unnecessary after going through the report and answering questions via phone/email. If you should find it neccessary, we offer Saturday walk throughs for an additional $100.00 (you are welcome to schedule a Saturday inspection up front for an additional $100.00).